Hey, I made a rhyme! Seriously though, I made it to northbound mile 318 – Sam’s Gap, and I quit the trail. When I left Hot Springs several days prior it had snowed and the forecast had snow in it for the next week. I was actually excited since I had carried all my winter gear since I left on February 6. Winter is coming kept running through my mind – I’ve been reading Game of Thrones every evening for the last month or so. 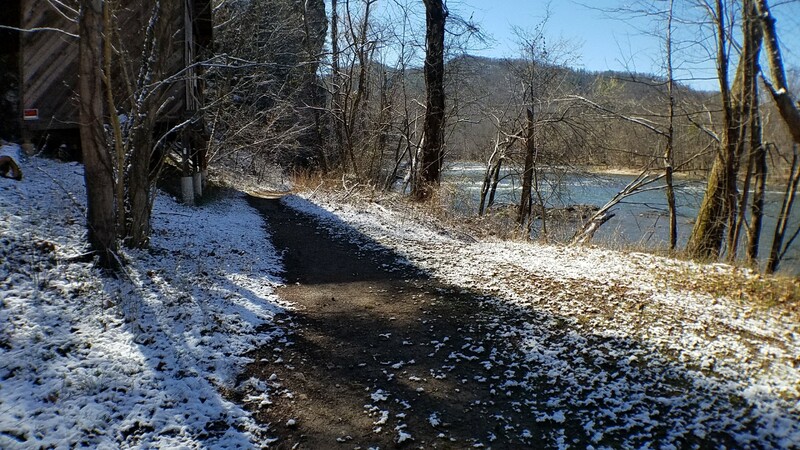 Trail along side the French Broad River right off the main strip. Two days in and we were hiking in snow as the forecast predicted. The snow covered mountaintops were gorgeous and it was a nice change of pace from just seeing the brown leaf covered ground. Gambit was absolutely loving it! Gambit has been having so much fun on the trail with me. It was so gorgeous out with everything coated in white. 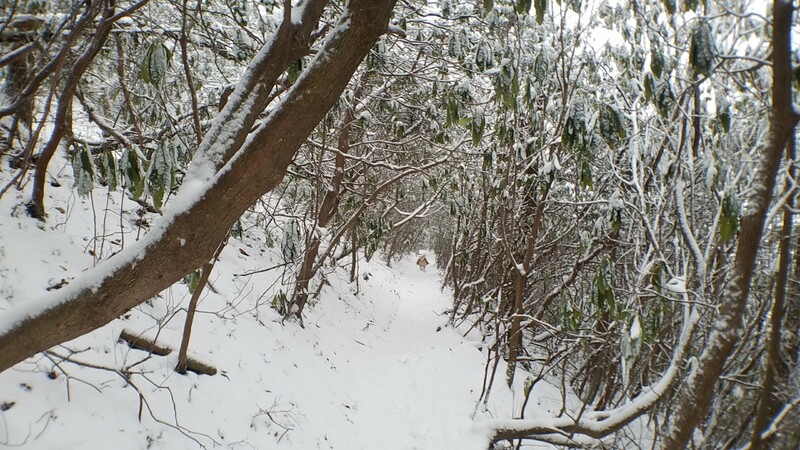 The going is slow, but it is so amazing romping through the white wilderness. 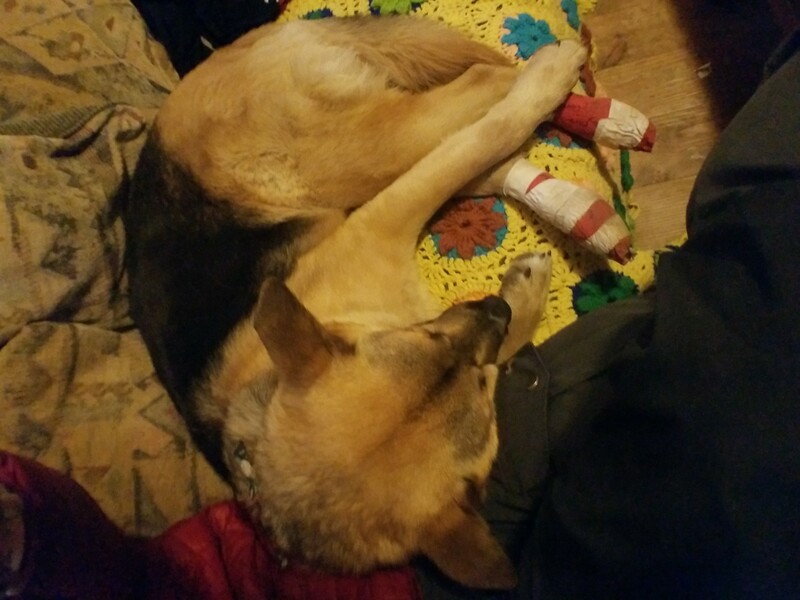 We were having a grand old time until Gambit ended up splitting open what looked like one of his back paw pads, he left blood spots in the snow for several miles as we made our way to Sam’s Gap. We got a shuttle into Erwin, TN and ended up getting a cabin at Uncle Johnny’s. I got a closer look at his back feet and he had split open a pad on each back paw. I knew there was no way we were continuing on with him like he was. I had some bandaging supplies from an earlier visit to a vet to wrap up his paws. He was in so much pain and kept trying to snap at me when would try to touch his back paws. I ended up having a friend help by holding him down while I put the steroid cream into each paw and wrapped them up. Some cuddling was required after the bandaging was complete. I felt so guilty that this had even happened, I had been so worried about myself and my own aches and pains for the last couple of days that I wasn’t even paying attention to how he was doing. 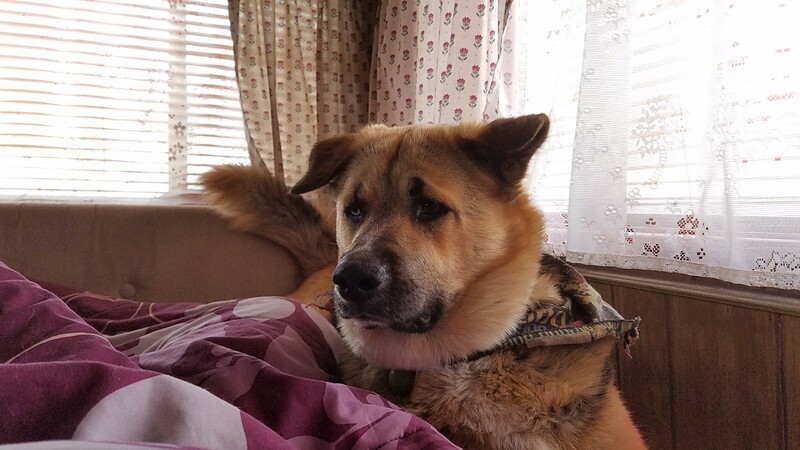 I sat there on the couch for a long while, held Gambit, cried and kept telling him how sorry I was and that we would be going home for a little bit to give him some time to heal. I had a friend drive down from Kentucky the next day to get us. We ended up taking two weeks off to give him plenty of time to recuperate. While we were home I got him a product called Musher’s Secret to use when we got back on the trail. It is a wax that you rub into their pads that protects them from drying out and cracking from extreme conditions (e.g. subfreezing temperatures and snow). If you’re hiking with a dog, make sure you keep a close eye on how they are doing. If you’re not putting hands on them daily they won’t let you know if they are hurting. It took Gambit bleeding for me to notice he was in pain. He must have been miserable those last couple of miles on the trail, but when I talked to him he would just smile, pant and wag his tail. Gambit and I are ready to get back on the trail. Good luck in your journey. Fair winds and following seas. Your journey will continue and Gambit will be ok after some rest and healing. People should get in the habit of checking their dog thoroughly after every hike, and even more so on a long distance hikes. Dogs need different attention and skillset on the trail – having proper first aid, bandages, nails trimmed, inspecting tendons and muscles. Ive had to slow my hikes down at first sign of injury. 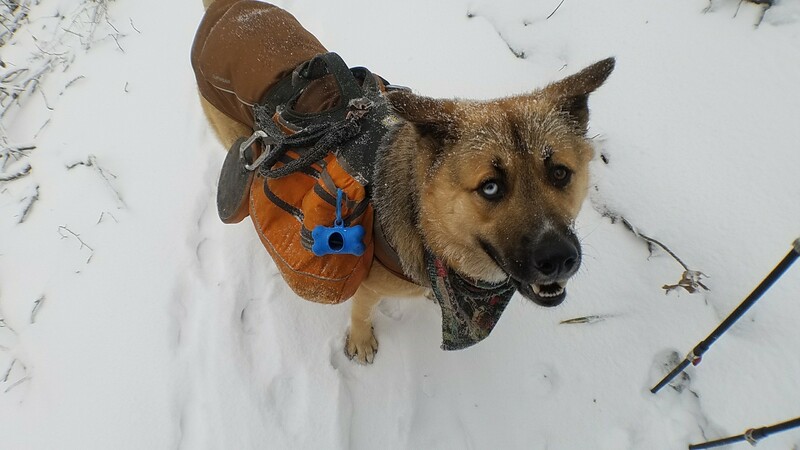 My dog packs 25% of her weight on the trail and always trains with realistic base. Working breeds will literally work – themselves to death for an owner they love, so it is imperative to be attuned to your dogs physical state. Best of luck on your joureny…look forward to following you both. Godspeed and healing vibes.